Here we have Volume 18 in The Carl Barks Library. 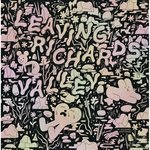 Fantagraphics' 15-year project to collect the entirety of Barks's Disney duck work in a 30-volume matched set, is now just shy of the halfway mark, as, while this is indeed Volume 18, it is only the 14th volume Fantagraphics has published, as they have yet to publish the first four volumes in the series, saving these early classic volumes for when the time is right. This volume is the second which is entirely taken up by classic 10-pagers. 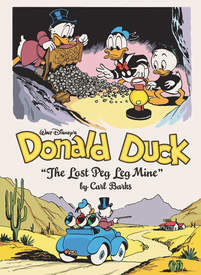 The twist this time around is that one of them, the titular "Lost Peg Leg Mine" in not from an issue of Walt Disney Comics and Stories, but rather an issue of Donald Duck (#52). Was it originally slated for WDC&S and then switched over to DD? Who knows! (This possibility is not touched upon in the notes). Regardless, we have 17 consecutive Barks mini-masterworks here, all from 1956 & 1957. Hi-jinx, laughs and adventure await!